Gold experienced quite a turbulent session on Tuesday as the sellers wrestled with the bargain-hunters against a background of rising economic optimism punctuated by renewed eurozone jitters. Bullion prices initially swooned to the sub-$1,635 area (an important support zone at this time) only to claw their way back to nearly unchanged (down $2.90) status at around the $1,650 pivot-point by day’s end. Silver, platinum, and palladium all eked out small gains for the session, albeit palladium’s advance was quite notable, at nearly 2%. The news out of South Africa on the PGM production front was once again not very good. The country experienced a 47.6% decline in the output of said noble metals last month, owing to labor strife at major firms Impala and AngloGold. At least 196,000 ounces of platinum were not produced at the two firms due to six weeks’ worth of strikes at Impala and to safety stoppages at AngloGold Ashanti. This morning, the midweek session in New York opened lower as gold notched a fourth day of losses, and traded near $1,640 per ounce. Anxieties connected to China’s economy flared up once again this morning in the wake of reports that home prices in that country fell once again, with 46 out of 70 urban areas that are being tracked showing declines in March. Housing (as was the case in the US) remains the principal risk factor in whether or not China touches down gently or impacts the economic runway with brute force. "We are seeing very little demand from the physical dealers, very little demand from the investors, it’s pretty much come to a standstill and I think we have to come off (in price)." Dealers and technical analysts are still targeting the $1,600 pivot-point as the next logical test for the yellow metal, since bullish news that would propel it back to last week’s high near $1,680 are indeed scarce. Silver fell 20 cents to the $31.50 support zone once again, but platinum advanced $3 to $1,582 and palladium gained $1 to climb to the $662 mark per ounce. Over in India, that country’s central bank cut its short-term lending rate by half a percent as it showed worries about economic growth. On the other hand, after having recently focused on the gold import problem (as a contributor to current account deficits and to India’s macro-economic woes), India’s officials are now going after non-bank financial companies and the plethora of gold loans they now have on the books. 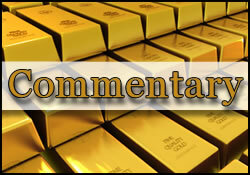 It seems that the "gold problem" is now under scrutiny along several regulatory fronts in India. "There has been significant increase in loans by NBFCs against gold in the recent period. There are also complaints against some NBFCs that they are not scrupulously following proper documentation process and know your customer (KYC) norms, among others, in order to quickly dispose off [sic] the cases relating to gold loans." "No imports of gold have taken place in the last one week after the market opened. The demand is lacklustre and there will be hardly any growth in the Akshaya Tritiya period this year." Switching locales, reports out of China appear to indicate that the country is far, very far, from the scenario that seems to be continually on offer in various hard money publications. You know, the one about China suddenly getting a serious case of an allergic reaction to the US dollar and US debt instruments, and diving headlong into gold — to the tune of hundreds or thousands of tonnes. Well, the US Treasury tallied an increase in China’s holdings of Treasuries $1.18 trillion in February. Japan was not far behind China, taking $1.096 trillion of same. In all, not only is China not getting ready to dump things American on the financial side, but aggregate net purchases of US Treasuries climbed to $5.1 trillion- a record. Just don’t tell that fact to your favorite "US Doomsday Monthly" publisher. They might cut your subscription off, for you. Meanwhile, over in the USA, the Dow had a very, very good day indeed (best one in a month, actually), gaining nearly 200-points on the back of a tech rally powered by (who else?) Apple and by IBM. Later in the day it was also explained that US stocks climbed on account of the easing if immediate fears about Europe in the wake of a relatively successful auction of Spanish bonds. Crude oil enjoyed a good day as well; a barrel of black gold climbed by $1.32 in value to finish above the $104 level following encouraging IMF projections for the global economy. The International Monetary Fund lifted its estimates for planetary economic expansion after several previous cautionary statements about the same in recent weeks. The institutions now expects that the unwinding of the financial crisis (yes, unwinding) and the improvement in financial conditions (yes, improvement) will make for a potential rate of economic growth near the 3.5% level in the current year, and for a possible 4.1% rate of similar progress next year. However, there are still signs of fragility in the process and places such as Spain had their growth estimates cut by the IMF, owing to current "difficulties." As for the American economy, the most recent set of statistics reveal that Mr. & Mrs. Joe Sixpack ignored the price of gas at the pump, that they did not blame President Obama for such, and that they took to shopping once again and thereby helped the US economy get back on track. Along the same lines, while builder confidence slipped in April, the number of permits for new construction being applied for belied that manifest sentiment of doubt. "[US] retail sales added to signs that growth is strengthening, with last month’s 0.8 percent gain almost three times as large as projected, according to the US Commerce Department." Merchants ranging from Jamba Juice to Mattress Firm have shown that, as far as they are concerned, hiring more folks will be the name of the 2012 game for them. One of the things worth noting in the hiring plans of such firms is the fact that it is ultimately decent store sales that engender the filling of new positions. It is also worth remembering that 25% of American workers are employed in the retail sector. Another development that is flashing signs of disappointment to those speculators who are still looking to the Fed to come to their ‘rescue’ with a fresh helping of QE, is the fact that the US is now seen as not repeating last year’s foray into an economic soft-patch. All of the important metrics concerning the balance sheets of banks, the level of retail activity, the number of loan delinquencies, etc., are lined up in a fashion that would make quite difficult for the Fed to rationalize the launch of yet another asset purchase plan; even an inflation-sanitized one for that matter. The aforementioned signs of real progress on the economic front (in the US for starters) and the abatement of the intense crisis-flavored sentiment manifest from 2008 until late last summer made for somewhat more difficult conditions for the world’s producers of gold and silver bullion coins. Sales reports from Australia, the US, and other major coin-producing countries reveal a decrease in investor offtake in March. Clearly, declining bullion prices played a role in this trend as well, but the overriding sentiment-changer still appears to be the ebbing of the crisis that gripped investors’ psyches over the past several years. For example, sales of gold coins from the U.S. Mint totaled only 62,500 ounces in March. That was 15% lower than the level of sales recorded in 2011 in the same month, and only about half of what the Mint sold in January. Thus far this month, the US Mint has sold 12,500 ounces of gold coins, and if that rate continues for April, it could make for a 77% percent drop from last year. On a quarterly basis, the Q1 gold coin sales could come in at 42% lower levels than those seen in 2011. April US Mint silver coin statistics show 880,000 ounces sold thus far, as against 6.1 million, 1.49 million and 2.54 million sold in the first three months of the year. "In addition to worries about another potential flare-up (of debt issues) in the eurozone, markets are also watching developments in China with justifiable concern, given how prominent a buyer the country has become in a number of commodity markets over the years." While folks like Mr. Meir view the downturn in sentiment in the commodities’ space as "temporary" and others such as JP Morgan believe that, for example, a new copper ETF could imply a whole new level for demand for the orange metal, there are those for whom the current fondness for "stuff" spells real trouble, as in: "dot-com bubble" type of trouble. "No bubble is a good bubble, and all leave some level of misery in their wakes. But the commodity.com era has had a larger and more negative impact on the global economy than the tech boom did. The hype has created a new industry that turns commodities into financial products that can be traded like stocks. Oil, wheat, and platinum used to be sold primarily as raw materials, and now they are sold largely as speculative investments." "Copper is piling up in bonded warehouses not because the owners plan to use it to make wire, but because speculators are sitting on it, like gold, figuring that they can sell it one day for a huge profit. Daily trading in oil now dwarfs daily consumption of oil, running up prices. While rising prices for stocks — tech ones included — generally boost the economy, high prices for staples like oil impose unavoidable costs on businesses and consumers and act as a profound drag on the economy." "inexorable rise of China and other big developing nations will continue to drive a commodity super-cycle, a prolonged upward rise in the prices of commodities ranging from oil to copper and silver, to textiles, to corn, and soybeans." "the strongest common thread connecting the dotcom and commodity.com eras is the fundamental driver of all manias: the invention of "new paradigms" to justify irrationally high prices."